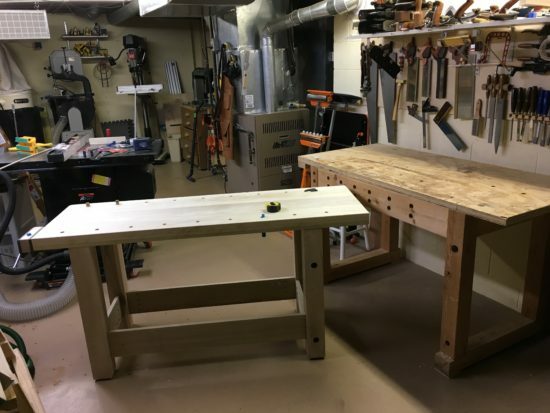 For years I’ve been saying I was going to build a new workbench for the basement workshop, and after just as many years of not doing it, it’s finally happened! 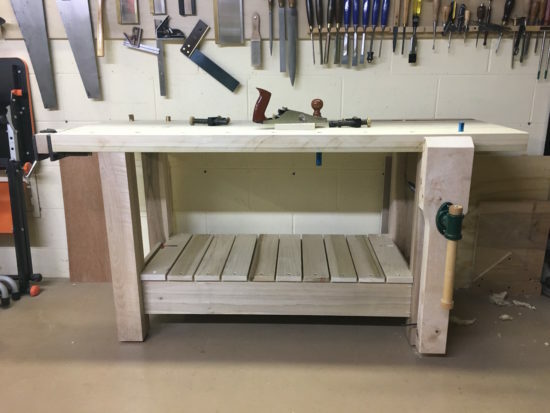 The “design” of the bench is simple, and the dimensions are perfect for a smaller shop like mine considering the goal turned from making a monster bench like we’ve seen in magazines, or elsewhere and instead turned to constructing something that would simply help me build projects easier than ever before. Today’s episode isn’t a construction video for “HOW I built the bench” but instead it’s a “TOUR” of its simple features, materials used in the construction, and a little bit about how I determined the dimensions and joinery. If you’re wondering about the episode I mentioned regarding building the plywood top for the old bench, you can find it by clicking here to visit episode 290. Holy skinny Matt! Looking good my friend! Thanks for the episode, hope to see more! Thanks Jordan! No promises on if and when the next video is coming, but hopefully I can find more time now that I’m getting settled into the job. Jordan beat me to it! Holy skinny is right! Its nice to see another video out of the basement workshop again! Its been to long. Can’t wait to see your next build on that great looking workbench. Keep it coming. Great to see you back! I’ve missed your videos my friend. Oh and, by the way, you’re looking great…keep it up. Thanks John! Feeling good too. Nice bench. A few years ago I built a similarly sized bench for my son at his new home on his birthday. With that as a prototype I built a slightly smaller bench for my shop. I like the narrower width because with it up against the wall I can reach the tool racks without having to lean on the bench. I haven’t installed a tail vise because I was searching for the perfect one. I think I should follow your lead and bolt on the small vise that I removed from the old bench. Thanks David! I spent so much time over-thinking this bench. So when I finally stopped thinking about it, the whole thing came together. For certain the narrow depth and shallow height no longer means I’m “stretching for the tool wall” that’s something I didn’t think was a big deal at first, but now it’s one of my favorite features. Missed your videos and presence in the podcast world. As the others have said, bench looks great, you look great and hope all is well! I like the bench. I started woodworking about a year ago and ended up buying a bench because I was afraid I’d never get one built and I would start working with my handtools. A year later, I feel confident enough to make one. I want a second bench so that I have a place to do glue ups, finishing, and just other general stuff. What you have here looks to be about perfect. I hadn’t thought of poplar, that may be a good choice given its price locally. Hey Matt – thanks for the tour of the new bench!! It looks great. I was wondering about the height – it looked a little short at first glance – but walking through your reasoning made a lot of sense. Keep up the good work! Looks great! Nice to see you back – have definitely missed your videos! Workbench looks great! I’m sure you’ll enjoy using it. But I did have a question. Why did you place the legs that way instead of flush to the top like Roubo? Is there an advantage to the inset legs? The only reason I placed the legs the way I did was because taking them flush to the top (which I did think about for a long time) seemed like a lot of work! Another thought that helped me to drive the idea home to set them the way I did was that when it comes time to resurface the top, I didn’t want to deal with touching endgrain. So in short, it was the lazy woodworker in me that didn’t want to work harder than I had too.